Authors: Haque, M. S., Hasan, M. M. & Hossain, M. M.
Abstract: This research work was done under public private partnership approach to reduce the tray consumption, increase the field capacity of mechanical transplanter and provide suggestion for wide scale adoption of mechanical transplanting. A 6-row ride on transplanter was used to carry out this research at Hatgobindapur, Chandpur in Natore district during aman 2014 season. This machine has ten seedling density setting, four depth controls and four space setting options. Data were collected from 149 plots covering 10.64 ha. It was observed that field capacity of the transplanter depended on plot to plot distance, plot size, seedling tray supply and number of plots under transplanting activity. Fuel consumption was obtained 19.28 litre per hectare. Results revealed that almost 92% trays were required in mechanical tansplanting, 2% for gap filling and 6% in pocket area filling by manual labour due to irregular shape of the plot. Throughout the operations, 52% time was spent in plot to plot movement and as idle time. One extra skilled labour was needed to load and unload the tray in the machine. Among the transplanting plots, 70% were uniform, 25% were irregular and 5% were mostly irregular. Irregular and mostly irregular plots should be avoided to increase effective field capacity of the transplanter. During study period, 25% trays were saved after providing technical support. Effectiveness of the transplanter was proposed to improve the business opportunity of mechanical transplanter in the fragmented land holding system. Calibration should be done on space and seedling density setting based on soil condition, soil type, seedling height, seedling density before operation in each plot to get optimum plant spacing and number of seedling dispensed in each stroke. Operator should keep the record of tray requirement in each plot and close contact with the help of a monitoring officer. Seedling tray requirement in each plot can be reduced by adjusting plant to plant spacing and seedling density setting. Smaller plot should be avoided to increase the daily area coverage of the transplanter. Key words: Rice transplanter, tray requirement, field capacity, missing hill and fuel consumption. Saiful Islam, A. K. M., Islam, M. T., Rabbani, M. A., Rahman M. A. & Ziaur Rahman A. B. M. (2015). Commercial mechanical rice transplanting under public private partnership in Bangladesh. Journal of Bioscience and Agriculture Research, 06 (01), 501-511. Saiful Islam, A. K. M., Islam, M. T., Rabbani, M. A., Rahman M. A. & Ziaur Rahman A. B. M. “Commercial mechanical rice transplanting under public private partnership in Bangladesh.” Journal of Bioscience and Agriculture Research, 06.01 (2015): 501-511. Saiful Islam, A. K. M., Islam, M. T., Rabbani, M. A., Rahman M. A. & Ziaur Rahman A. B. M. “Commercial mechanical rice transplanting under public private partnership in Bangladesh.” Journal of Bioscience and Agriculture Research, 06, no. 01 (2015): 501-511. Abstract: Brassica rapa (AA, 2n = 20) is a prime oilseed species in Bangladesh that can be improved via biotechnological approaches. Rescue of developing embryos after an interspecific hybridization, which otherwise usually tend to abort, is very important for improvement of this species, that require an efficient embryo culture protocol. The immature torpedo shaped embryos (451-700 µm) and mature walking-stick type (>700 µm) embryos of five B. rapa varieties namely, Safal, Agrani, BINA Sarisha-6, BARI Sarisha-6, BARI Sarisha-15 were cultured in basal MS media supplemented with 1 mgL-1 BAP, 0.5 mgL-1 NAA & 1 mgL- 1 2,4-D. The immature embryo culture followed indirect somatic embryogenesis process but the mature embryos followed direct organogenesis. The immature embryos induced callus within 11-15 days whereas the mature embryos regenerated plantlets through direct organogenesis within 8-11 days. The varieties Agrani, BARI Sarisha-6 and BINA Sarisha-6 induced the highest percentages of callus from immature embryos and the varieties Safal and BARI Sarisha-15 regenerated the highest percentage of plantlet from mature embryos. Safal and Agrani induced callus and regenerated plantlets comparatively earlier than other varieties. An increase in the concentration of BAP from 10 to 20 ppm in MS media + 5 ppm IBA decreased the size of the plantlets of all varieties except the Agrani. The data could be used in improving the existing embryo rescue protocols. The direct organogenesis process of mature embryos can potentially shorten the breeding cycles. Ali, M. R., Mehraj, H. & Jamal Uddin, A. F. M. (2015). Effects of foliar application of zinc and boron on growth and yield of summer tomato. Journal of Bioscience and Agriculture Research, 06(01), 518-529. Ali, M. R., Mehraj, H. & Jamal Uddin, A. F. M. “Effects of foliar application of zinc and boron on growth and yield of summer tomato.” Journal of Bioscience and Agriculture Research, 06.01 (2015): 518-529. Ali, M. R., Mehraj, H. & Jamal Uddin, A. F. M. “Effects of foliar application of zinc and boron on growth and yield of summer tomato.” Journal of Bioscience and Agriculture Research, 06, no. 01 (2015): 518-529. Abstract: To find out shading effect of some selected tree species and different orientations on the yield and yield attributes of rice cv BR11 in agro forestry system an experiment was laid out in two factorial, Randomized Complete Block Design with three replications. Rice was grown in different orientations around the tree of Albida, Akashmoni and Jhau (North, South, East and West orientations), as the orientations were made 1 m apart from the tree base. The effect of tree-rice association was found significant on plant height, effective tillers hill-1, non-effective tillers hill-1, effective grains panicle-1, sterile spikelets panicle-1, total grain (t ha-1) and straw yield (t ha-1). It was recorded that out of the three tree-rice association, the highest yield (4.88 t ha-1) was found under Albida and the lowest yield (4.70 t ha-1) was found under Akashmoni that was statistically similar with Jhau. The highest (7.10 t ha-1) and lowest (6.80 t ha-1) straw yield were found under Albida and Akashmoni. The highest plant height (105.75 cm), effective tillers hill-1 (11.85), non-effective tillers hill-1 (1.91), effective grains panicle-1 (140.65), and sterile spikelet panicle-1 (29.88) were found under the Albida. Regarding different orientations from the tree base, the plant height, effective tillers hill-1, non-effective tillers hill-1, effective grains panicle-1 and grain yield (t ha-1) of rice were significant. The highest grain yield (4.86 t ha-1) of rice was obtained at the north orientation and the lowest grain yield (4.60 t ha-1) of rice was obtained at the west orientation, while significantly highest grain yield (5.00 t ha-1) was found in control. All parameters produced the highest performance in open field compared to tree-rice association in respect of orientation. Shammi, R., Abdullah, M. R. & Rahman, M. M. (2016). Yield of rice in response of shade and orientation. 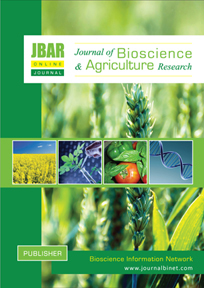 Journal of Bioscience and Agriculture Research, 06(02), 547-552. Shammi, R., Abdullah, M. R. & Rahman, M. M. “Yield of rice in response of shade and orientation.” Journal of Bioscience and Agriculture Research, 06.02 (2016): 547-552. Shammi, R., Abdullah, M. R. & Rahman, M. M. “Yield of rice in response of shade and orientation.” Journal of Bioscience and Agriculture Research, 06, no. 02 (2016): 547-552.